The Alutiiq Museum is in its second year of documenting ancestral sites on Afognak Native Corporation lands. 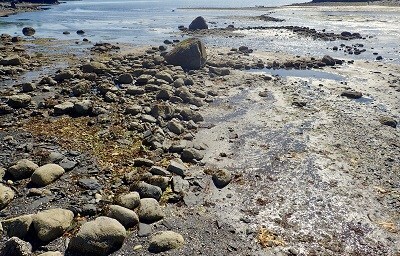 While surveying one area, museum Curator of Archaeology Patrick Saltonstall said he noticed something on the shoreline at low tide. Saltonstall said he identified it as a fish trap, which he calls a corral. “They’re like stone walls on the inter-tidal zone so when the tide came in, all the fish went to go up stream, would float in over the corrals or the trap, and then when the tide went out, they’d be stranded in the pens, so then you catch a whole lot of fish,” Saltonstall said. Saltonstall said it can be challenging to determine whether a corral is natural or man-made, but he sees evidence of it being a fish trap. Saltonstall said this is the first time’s he’s ever seen a corral like this one on the island, but they’re common in southeast, which he said could because the people there used them more frequently. “But another thing is a lot of the places down there are more protected, they aren’t as open to the ocean as Kodiak is, so maybe the lower energy they tend to be preserved better, whereas in Kodiak after a big storm a lot of these things might get demolished,” Saltonstall said. 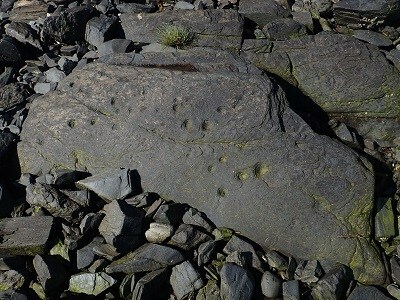 Saltonstall said they found what looks like petroglyphs nearby – speckled dots and incised lines carved into slate. Saltonstall said it’s hard to determine the age of either the corral or the petroglyphs, but based on nearby archaeological sites, the carvings could be dated back to about 500 years ago.